Dr. Soo Han is the Director of Orchestral Activities at The Baldwin Wallace Conservatory of Music, a contributing editor for Hal Leonard’s Essential Elements for Strings, a D’Addario Orchestral Strings Artist, Conn-Selmer Educational Clinician, a member of the Board of Directors of The Midwest Clinic - International Band and Orchestra Conference, and the former Director of Orchestras & Department Chair of the William H. Duke Center for the Performing Arts at Carmel High in Carmel, IN. As an active conductor, he has appeared with Carmel Symphony Orchestra, Cave Run Symphony Orchestra, Michigan State Opera Theatre, Michigan State Symphony Orchestra, Valparaiso University, and Butler University Symphony Orchestra. 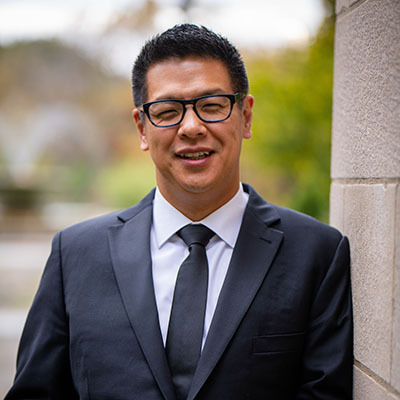 He is an active conductor for All-State, regional, and honor orchestras appearing in over 30 states and has conducted internationally in Austria, China, and Australia. He has collaborated with numerous artists, groups, and conductors such as Lynn Harrell, David Kim, and the Indianapolis Symphony Orchestra. He has produced multiple recordings of complete symphonies and has premiered several commissioned works for strings and full orchestras. He has presented workshops and clinics internationally and for nearly every major national and state music conference including, Australian String Teacher Conference, Maryborough National Australia Conference, Midwest Clinic, ASTA National Conference, NAfME National Conference, and Ohio University Summer String Teacher Workshop. Orchestras under his leadership experienced a great deal of success including 9 Indiana State School Music Association (ISSMA) State Championship and being named Grand Champions at the National Orchestra Cup at Lincoln Center’s Alice Tully Hall. As a passionate supporter of public school music programs, he continues to remain active in instrumental classrooms throughout the country. He is the past-president of the Indiana American String Teachers Association and the chapter was awarded the ‘Most Improved Chapter’ during his time as president and recently served as the National American String Teachers Association’s K-12 Committee Chair. He received his Bachelor of Instrumental Music Education degree from Indiana University Jacobs School of Music, Master of Science in Education from Indiana University School of Education, and received his Doctorate in Orchestral Conducting from the Michigan State University College of Music.